On average, every day natural disasters will directly impact 80,000 people, costing the global economy more than $270 million. What if technology could help improve these figures? This is the premise of the global Call for Code initiative, a massive hackathon that challenges participants to figure out how to use most effectively AI, Blockchain, Cloud, Data and IoT technologies to improve communities’ disaster preparedness and resiliency. Syracuse University students and Central New York community members are invited to join in the international effort at a two-day hackathon—Friday, Sept. 14, and Saturday, Sept. 15—at SU’s E.S. Bird Library. Registration is free with signups via Eventbrite: CallForCodeSU.eventbrite.com. Participants will receive a complimentary dinner on Friday, plus breakfast, lunch and an after party on Saturday. The event is hosted by The Blackstone LaunchPad at Bird Library, SU’s Office of Corporate and Foundation Relations and Syracuse University in partnership with IBM, David Clark Cause, United Nations Human Rights, The Linux Foundation and The American Red Cross. Participants in the SU event (developers, marketers, designers) may work in teams up to five or individually. They will have an opportunity to pitch their plans to a panel of judges, after which the winners of the local competition will be announced. And the competition doesn’t end on Saturday. All participants will have until Sept. 28 to refine their codebase and submit their final Git Repo and three-minute pitch video to the Call for Code site. All submissions from across the world will be reviewed by IBM and partner judges, and winners will be announced Oct. 29 during a live-streamed all-star concert and award event at the Regency Ballroom in San Francisco. The first-place winner in the global competition will receive $200,000; second and third place will receive $25,000; and fourth and fifth place will receive $10,000. 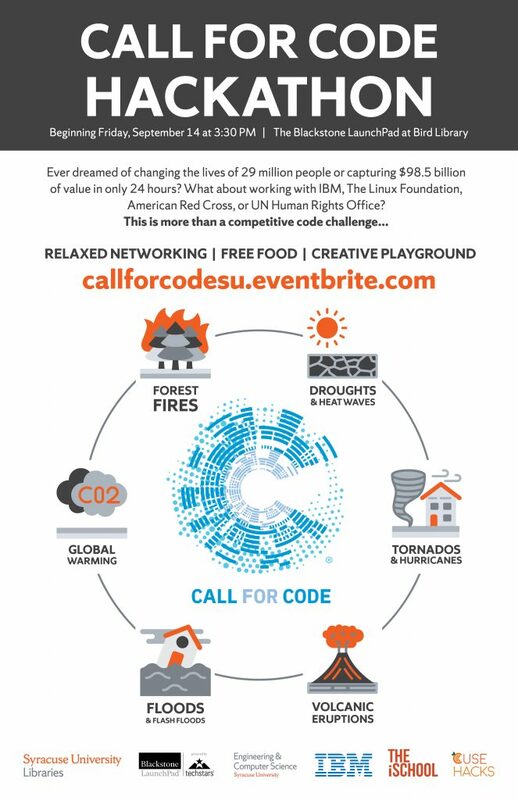 Call for Code is a competitive challenge, but unlike any other hackathon, the first-place winner will will have the opportunity to deploy their technology via IBM’s Corporate Service Corps and pitch their solution to New Enterprises Associates for evaluation and feedback.